It would be an understatement already to begin with saying that the notion of public space is contested nowadays. In the narrowest definition the function of public space would be to provide spaces for social interaction. The question of how architecture can produce “public spaces” isn’t simply a problem of modern architecture vis-à-vis neo-liberalism but firstly of the deconstruction of the place and the home and secondly of the forces external to architecture that are interwoven in this process. The home is no longer simply a place or a dwelling but a story, a narrative, a sense of belonging; it appears as a horizon and search for new destinations rather than a place in the past or sense of origin. On the other hand, space appears not as an object but as a process: Space is the mediator between mental and social activities and is thus conceived as a social product. In any contemporary discussion about the production of public space, one cannot but notice that in something so abstract as space there is a noise in the background, which configures this space as much as it configured by it: The images through which this space is constructed and of which it is not independent, and the visual memory becomes an open archive of how the collective ideas about a certain place are presented. These questions are at the heart of “Background”, Bahrain’s National Pavilion at the 13th International Architecture Exhibition – Venice Biennale (2012) to which Bahrain returns after winning a Golden Lion for its first national participation in 2010 but yet hued by the shift of the image of Bahrain from an exotic island in the Arabian Gulf to an scenario of unrest. The exhibition questions the real against the presented and imagined images of Bahrain since the proliferation of photography and media. The nature of images generated by mass-media in the era of hyper-realities obscure the relation between the images and its referent – the supposed real, creating a reference principle in which images always refer to a real world and real objects in it, but this is hardly the case. More often than not, images exist on their own and rather than reproducing something logically anterior to themselves, they precede the real and have the capacity to invert the order of reality. Images of reality are not a mirror of reality but rather a mirror already broken and they are not linguistic symbols, they don’t mean to say anything, but rather, stand in reference to themselves alone. The exotic images of Bahrain before oil are juxtaposed to the oil infrastructure and modernization, the sectarian unrest in the 1990’s, the arrival of Formula One, the tabloid images of Michael Jackson and finally, the near-apocalyptic footage of large scale demonstrations in 2011, all of which show historical moments and transformations creating an imaginary about Bahrain that hardly coincide with the moving flux of reality: The existence of objects hardly coincides with the structure of reality that is not merely an image but rather a larger superstructure of shared stories, perceptions and reality beliefs. 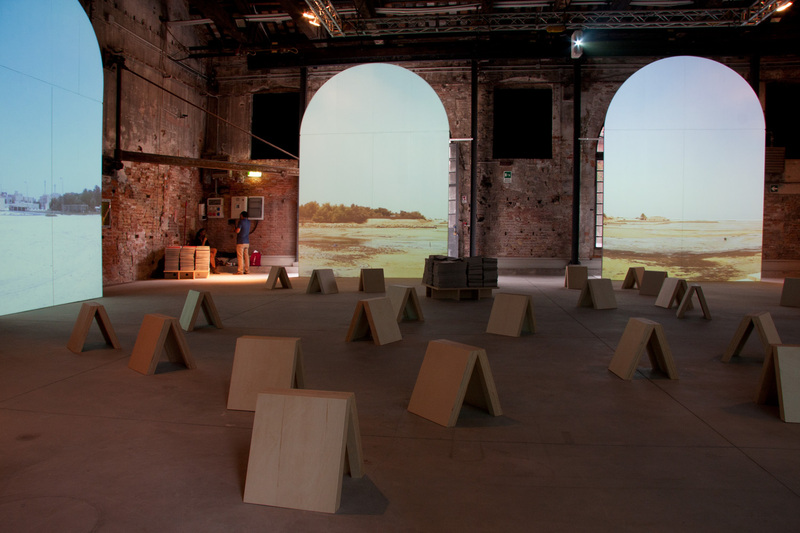 The exhibition curated by Noura Al-Sayeh and designed by Francesco Librizzi,Matilde Cassani and Stephano Tropea is a room-large installation in which visitors experience the contrast between images of Bahrain that offer windows into images of Bahrain against the five screens which offer real windows into different video feeds of Bahrain in its everyday setting, creating a juxtaposition between the video-art equivalent of still life paintings that yet occasionally move against the endless fabrication and proliferation of images that show how the imaginary is always partial. Bahrain is not only offering windows into its present and imagined past but also a strong criticism about the interplay between both and atomizing any attempt at a grand narrative which is fueled by images alone. Musicologist Hasan Hujairi writes in his essay “Bahrain’s transformed soundscapes”: “Such sounds may still exist, or may have never existed at all. However, in light of the events which took the region by storm – Bahrain notwithstanding – these sounds are no longer the same.” What sounds are those? The megaphones at the top of minarets? Construction sites? Political unrest? Perhaps the exhibition wasn’t exactly architectural but up to a point, it is an acute reflection of how politics and architecture redeem each other in the sense that the political notion of public space is an essentially architectural one as in the space in which things appear in the world. Nikos Papastergiadis, Spatial Aesthetics: Art, Place and the Everyday(Amsterdam: Institute of Network Cultures, 2010): 26. Henri Lefebvre, The Production of Space (Malden, MA: Blackwell, 1991): 68-168. Jean Baudrillard, “The Evil Demon of Images” in The Continental Aesthetics Reader, ed. Clive Cazeaux (London: Routledge, 2000): 444. Sarah Kofman, “The Melancholy of Art” in Selected Writings (Stanford, California: Stanford University Press, 2007): 210-211. Sandra Lehmann, Wirklichkeitsglaube und Überschreitung: Entwurf einer Metaphysik (Vienna, Austria: Turia + Kant, 2012): 35. Susan Sontag, “The Pleasure of the Image” in Where the Stress Falls (New York: Picador, 2001): 143. Susan Sontag, “A Photograph Is Not An Opinion. Or Is It?” in Where the Stress Falls (New York: Picador, 2001): 251.